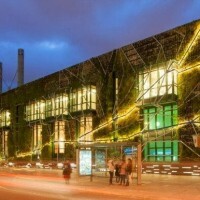 Urbanarbolismo have designed a vertical garden for the Palacio de Congresos Europa (Palace of Congresses Europe) in Vitoria-Gasteiz, Spain. 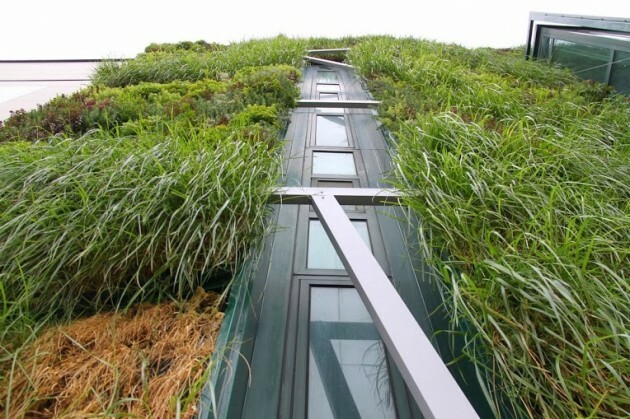 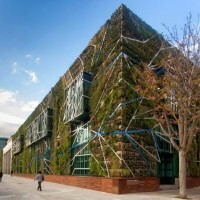 The city of Vitoria- Gasteiz is recognized internationally for integrating biodiversity and green spaces in the urban architecture. 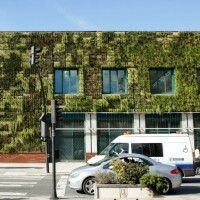 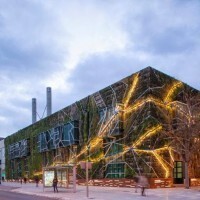 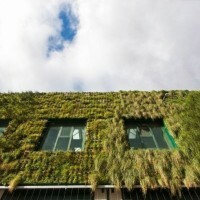 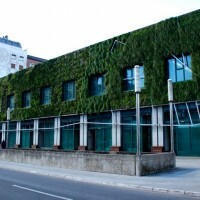 Within the Inside Green Ring Project Urbanarbolismo and Unusualgreen studios have made this green facade to bring the sorrounding ecosystems to the city center. 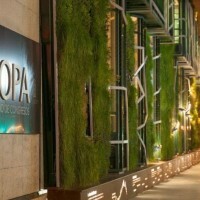 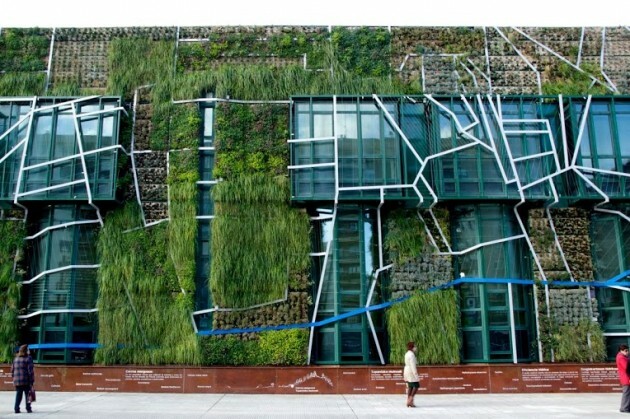 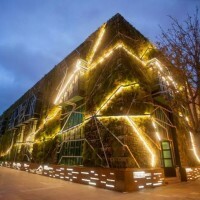 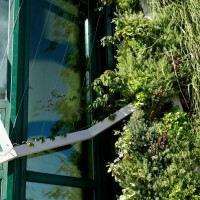 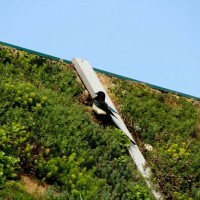 The vertical garde has a total area of 1492m2, of which 1000m2 are an hydroponic vertical garden system f + p and 492m2 are made of climbing plants covering the windows. 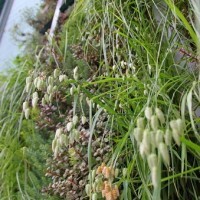 We have been used more than 33,000 native plants of different varieties from Alava and the Basque Country . 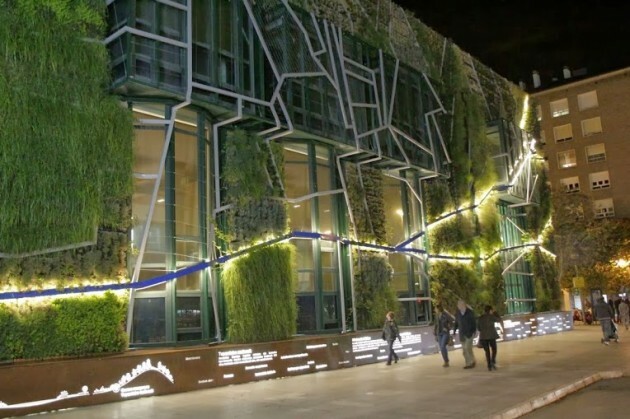 The main reason to make the project was to improve energy consumption of the Palace of Congresses, the vertical garden “f + p preplant ” system adds a thermal resistance of 2,644 m2.K / W . This represents a 270% increase on the existing facade insulation, resulting in energy savings. 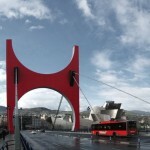 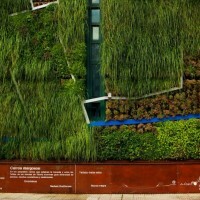 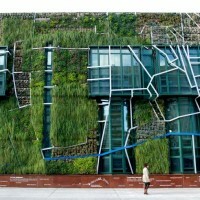 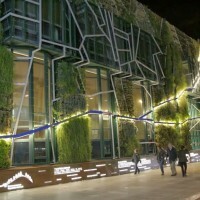 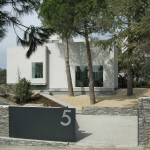 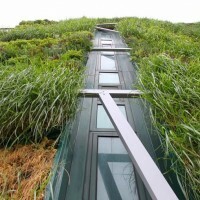 The design performs the ecosystems that exist in the surrounding of the city of Vitoria-Gasteiz. 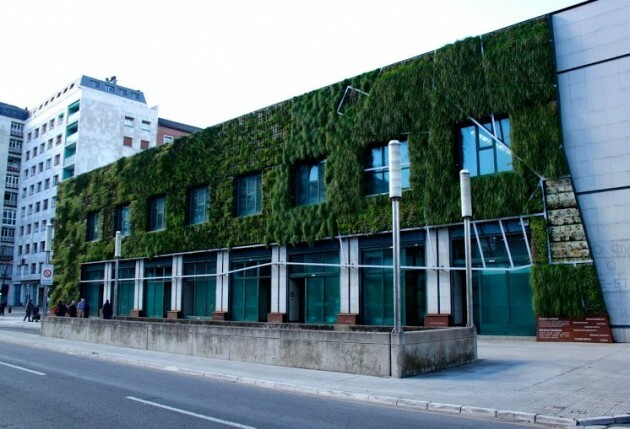 From left to right the facade shows the wetland vegetation of Salburua, the agricultural field plots Alava, the ecosystems from the loamy hills and beech forests of the mountains of Vitoria. 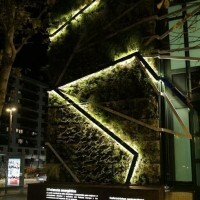 At the base of the facade we have placed a corten steel backlit socket which contains an explanation of the ecosystems and plant species of the vertical garden. 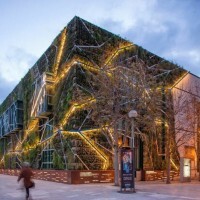 97% of the species used in the garden are native or endemic from Álava. 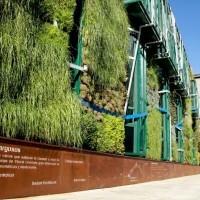 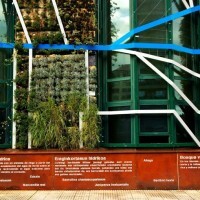 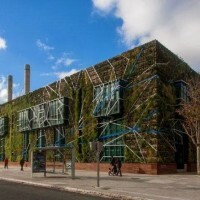 This is one of the first vertical garden reproducing native ecosystems of the area where it is located.The use of native plants in the design has been one of the main challenges of the project, many of the plants from Vitoria are adapted to periods of drought and are struggling to survive in moist environments such as conventional vertical gardening systems. 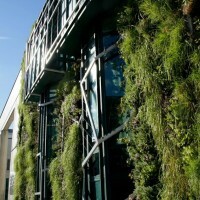 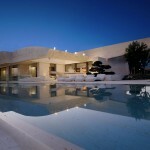 For this project we redesigned the f+p system, optimizing substrate saturation so that these plants can perfectly grow . 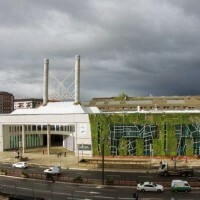 The hydroponic system used to maintain this garden gives the optimal substrate nutrient conditions , pH, conductivity and humidity for this type of vegetation, the whole system is monitored by remote control in order to save water , energy and supervise the development of plants . 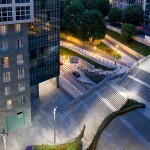 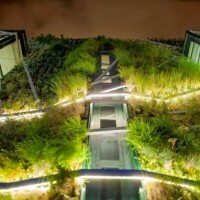 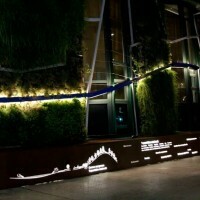 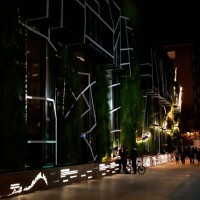 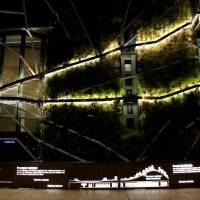 The river-profile that structures design vertical forest is illuminated at night by low-power LEDs. 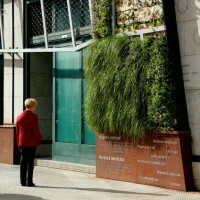 This creates an unique atmosphere for a walk in the center of Vitoria- Gasteiz.The corten steel base not only provides educational information on the garden, also becomes a space for relaxation and conversation, a bench in a Vertical Park.We were surprised how quickly nature breaks through the vertical garden, thanks to native plants it has been colonized by all kinds of insects and animals, the birds have quickly appeared, here you have a picture of a magpie foraging.